Their buzzes and snapping wings are heard as they defend their nesting territories and fly-catch from open perches. Arriving in April from a winter in Central America, they choose their nesting site and both the male and female defend their territory. The male has an impressive courting display as he twists and turns upward to 60 feet and then cascades down and tumbles toward the ground. The female builds the nest [as the male twerts her on] using rootlets, grasses, stems, and plant fibers. A final lining of hairs, string, and wool is added to protect the 2-7 white to pinkish with dark blotched eggs. Incubation for 12-19 days leads to a nesting period of 13-19 days where both parents are continually bringing crickets, grasshoppers, beetles, wasps and an occasional dragonfly to satisfy the nestlings. A collection of kingbirds is referred to as a "tyranny," a "court" or a "coronation" of kingbirds. 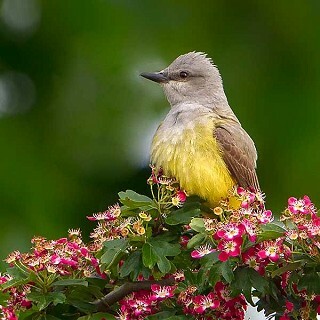 To view more images of the Western kingbird, visit http://abirdsings becauseithasasong.com/recent-journeys.